“The wild requires that we learn the terrain, nod to all the plants and animal and birds, ford the streams and cross the ridges, and tell a good story when we get back home.” That sentence comes from The Practice of the Wild, a captivating book of essays by Gary Snyder that shares his thoughts on wildlife, wilderness and the world. It often came to mind on major nature-embracing adventures such as the ascent of Mount Kilimanjaro, a week of backpacking on the Appalachian Trail, or a month on South Manitou Island. Last Sunday morning it came to mind in a place I would never have expected: the City of Troy, the 11th largest city in Michigan by population and the largest city in Oakland County, a region I equate with office buildings, upscale shopping plazas, landscapes of flatness and the constant din of traffic. Nature’s way in Troy? You bet! 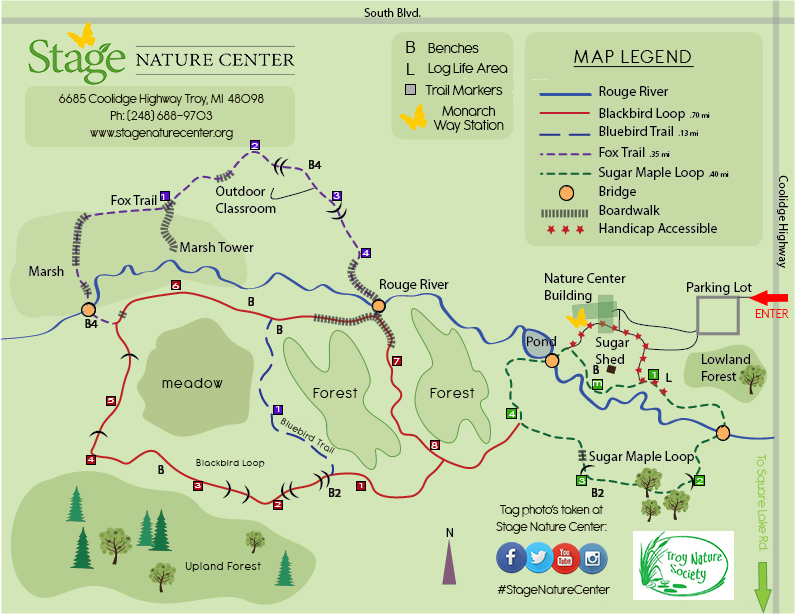 Troy is also home to a five star nature-embracing destination: the woodlands and marshes of the Stage Nature Center. It’s a 100-acre site of that is managed by the Troy Nature Society through an agreement with the City of Troy. Less than fifteen minutes after my arrival, I witnessed the courtship behavior of a handsome wild turkey strutting around his hens as a half dozen deer watched me trying to make myself invisible to the turkeys by leaning motionlessly against a trailside tree. At the same time, black-capped chickadees and at least one white-breasted nuthatch flitted around me as if they wanted to disclose my “hidden in plain” sight location. Nature adventure does not get much better than that in the urban wilds! That morning encounter left me with a good story to share and reminded me of a fact I all too often ignore: Wildness is all about us, even in urban areas, for nature is always struggling to find a way. I often wander spontaneously without a plan if not in a true wilderness, but maps are available at the trailhead and online. I suggest using them, for two miles of trail meander through the center’s woodlands, over boardwalks and small bridges, around meadows that lead to some good observation points – including a bluff at the edge of an upland forest, and a small observation tower that provides viewing of a marsh and the waters running through it. From the vantage point of the observation tower, I listened to red-wing blackbirds proclaim territory and could only imagine the great variety of bird life that will appear as spring soars ahead. If you walk slowly, look about, stop often and stay on the trail (which is required), encounters with wildlife will be frequent, with deer sightings all but guaranteed, for they are acclimated to humans trekking the trails. I kept an eye out for deer trails in the fresh overnight snow, and just by looking the way the tracks went, I often saw them. Some stood as I meandered along, but most accepted my gentle passage with barely a head turn. I was surprised that some parts of the terrain are hilly, for I think of Troy as the “flatlands” of our county. We can thank the glaciers for the hills and the related land features, including the gurgling headwaters of the Rouge River that meander through the property, now fed by melt from the marshes. The glaciers also left boulders as the great ice sheet retreated. A relatively small trailside boulder caught my attention. Birch trees grew around it, and it was fractured in the middle. If that boulder could talk, I would sit for hours to listen to its story of being ripped from the Canadian Shield by the crushing power of a sheet of mile high ice and then being transported, smoothed and “polished’” by ice, sediments and rushing water on its journey south. More likely than not, that boulder would also share tales of the mastodons that trekked the landscape not that very long ago – in historic terms, and perhaps it would also explain the natural processes that caused it to split almost in half. While crossing one boardwalk just as the sun broke through, adding blue to the sky, I thought I caught a glimpse of an eastern bluebird, but before I could raise my camera and focus with the telephoto lens, it was gone. However, skunk cabbage, still pushing its way up through the frost and ice of the marsh, was more than a willing subject for my camera’s eye. Every trail junction is well marked with signage and there are numerous signs along the way pointing the way back to the nature center, making the trails very easy to navigate and true portals into the ways of nature in these early weeks of spring. Some of the impressively large trees have cavities near the base that provide shelter to creatures and I suspect stir the imagination of youngster that attend the wealth of programs that are offered by the center. I doubled back to the Sugar Maple Loop to watch ducks on the Rouge River just yards from maple sap buckets that still hung from trees. It was a reminder of the end of their 2019 Rent-a-Maple program where a lease entitles the family name or business name to be displayed on a maple tree holding “their” sap collecting bucket, and a pint of finished syrup will be part of their reward for leasing a tree. A clever idea to involve residents in center operations and entice them into the ways of the wild. Before leaving, I was lured to the turkeys one more time by not so distant gobbles and clucks. I found the great gobbler continuing to strut his stuff, and the hens continuing to ignore him while scratching about the leaves for perhaps grubs or old seed and nuts. That was the perfect place to sit, relax, and skim through the Stage Nature Center brochure and trail map which I carried with me. The front cover of the brochure states “Where People and Nature Meet.” I could not agree more. Great writing and videos! Always so informative. Keep up the great work! Thanks Julie! Greatly appreciate your comments; this blog may have been ‘informative’ for the public, but it also produced discovery-teaching moments for me. I’m still in awe of the encounters with the turkeys. I really appreciate the Lloyd Nature Center since it is more easily accessible to me than some of the farther north parks. It’s small enough to not overwhelm, as well. I so appreciate that Troy has kept this pocket of nature in the midst of so much concrete. Thanks for the reminder, Jonathan. “A pocket of nature” describes it perfectly. It really is a treasure and a remnant of the wildness that was once all of Troy. Great write up. Lloyd Center is unique for sure. It is easy to drive past without knowing due to it’s small entrance, but it is a real treasure. I hope it continues a long time. Thanks for you kind words William. And I agree that it’s a real treasure, a hidden gem in the City of Troy. And I think the Wild Turkeys really liked the place too!